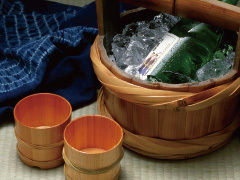 One of sake characteristics is that we can enjoy sake deliciously at a wide range of temperature. Most people think sake should be served with warm style; however, you can enjoy it both warm and cold depending on type, season, or foods. Generally, Ginjo style prefers to be served chilled to enhance their fruity aromas. Honjozo and Futsushu (ordinary sake) is said to be suitable for warm style. In addition, Junmai style is said that it has a wide range of suitable temperature from chilled to warmed. Free from stereotype thought, please try sake at various temperature. It is one of the ways of enjoying sake! There are various kinds of sake vessels. Generally, the way of drinking sake with mini sake cups called “Ochoko” is widely known; however, you can also enjoy drinking sake with wine glass especially for premium sake since it has really aromatic fragrance. Please try to drink with various sake vessels and find your favorite one. Sakazuki is generally made from earthenware, porcelain or lacquer. The shape is shallow and large-mouthed. 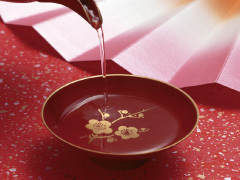 Especially, lacquered sakazuki have been used since ancient times by the nobles at banquets and ceremonies. It is still used at Japanese traditional wedding ceremony today. Holding and drinking with two hands is formal style; one to hold the bottom of the cup and the other to hold it from the side. There are a lot of earthenware Ochoko by tradition, but now, you can find a lot of glass Ochoko. Originally, ochoko had been used for serving small food in traditional Japanese full-course haute cuisine; however, it has been started to be used as Sake vessels since middle of Edo period. Even though it seems to be “Shot glass” because of its smallness, sipping slowly and deeply while enjoying foods and conversation with those who drinks together is real pleasure of drinking sake. A glass is used to serve chilled sake (below room temperature). 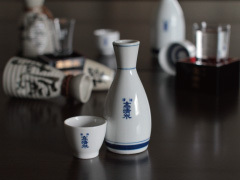 The Japan Sake and Shochu Maker Association recommends serving sake with a sake glass (110ml or 60ml). Apart from this, there are glasses in the shape of a Japanese drum (110ml) and stemmed glasses (65ml). If using wine glasses, a Bordeaux glass is suitable for nearly all types of sake. 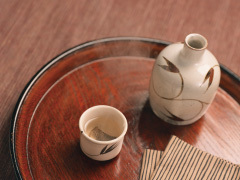 Warm sake is served with a 150ml-300ml sized earthenware vessels called tokkuri. There is wide color range: from containers with a simple indigo pattern to those with a more elaborate multicolor overglaze. In addition, there are various shapes, such as gourd and candles shapes. Glass tokkuri are sometimes used when serving chilled sake. 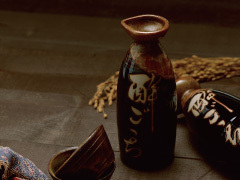 Warm sake called “kanzake” is one of the traditional style of drinking sake. 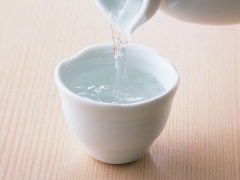 Warm sake goes well with various foods, especially warm dishes. In addition, it is said that proper amount warm sake is good for health. Warm sake and dishes will make your body and heart comfortably warm! ・When drinking chilled sake, it takes time to get drunk because alcohol is absorbed at temperature close to body temperature. Warm sake prevents the excessive drinking because of smooth absorption. ・It makes your body warm. ・Sake contains 100 kinds of nutrient compositions such as amino acid or organic acid, and it is said that these compositions are effective for skin whitening. In addition, moisturizing effect that sake originally has also makes the skin moister. ・The more good cholesterol increases, the more resistant arteriosclerosis gets. 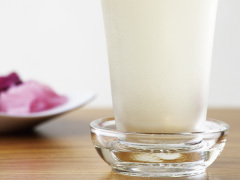 It is proved that good cholesterol increases by the compositions in sake. Boil the water in a big pot and take it off the fire when it comes to a boil. The water temperature should be just under 100℃. Then put your tokkuri into the pot immediately. It should be better if it is soaked in the hot water up to its shoulders. Leave that be for a while and pull tokkuri out from hot water after being your preferring temperature. In this way, sake can be warmed without losing its fragrance because it is warmed indirectly at lower temperature than volatilization temperature of alcohol. Fill a tokkuri with sake and heat it up with microwave. 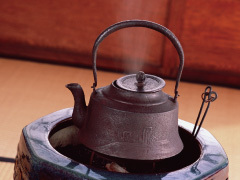 It is the easiest way to warm sake. 1 minute per 180ml as standard. The way of using the sake warmer dispenser. This machine is still used at some Japanese style bar. Sake flows through specialized tubes in a warming bath, which gently heats the sake without impacting on its taste or clarity.